Includes down payment with no security deposit. Excludes taxes, title and either dealer fees or documentary service fee. For well-qualified lessees. Situated just a few miles from Hilton Head, Bluffton provides an ideal location to search for an excellent used car. Your local Honda dealership in this community invites you to explore our outstanding selection with confidence. We'll do our best to help you find a quality vehicle meeting your unique requirements! As you probably realize already, our inventory changes with some frequency. 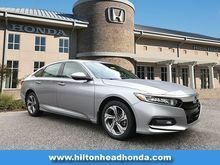 Many shoppers in the Hilton Head Area visit us to search for solid automotive values. Let us know about the features you desire in your next vehicle. We'll notify you immediately when a car meeting your description comes to our attention. Why do many drivers prefer low mileage, previously owned vehicles? Sometimes careful shoppers uncover some extraordinary bargains in this automotive category. These autos typically command lower prices than comparable brand new models, so sometimes customers pay a lower purchase price simply by selecting a used car. Additionally, a used vehicle tends to depreciate more slowly than the latest models. Some customers also like the availability of extensive online reviews about these makes and models, too. We'd like to welcome you to get in touch with us as soon as you discover a used vehicle in our inventory of possible interest to you. We'll try and help you arrange for a test drive quickly. Taking this step will help you decide whether or not you've located an auto capable of meeting your driving requirements. But one word of caution: if you think you might have found a good match, don't wait to take action! Quality used vehicles in the Bluffton Area sometimes don't remain available on the marketplace very long. Let us know right away about your interest in any of our low mileage quality used cars and trucks!